I realize that there are probably some really good reasons for this scheduling decision, but I'm just not in the mood to try to comprehend it. Well that's it for today. Although I'd love to see Ichiro have a great outing in the Japan Opening Series, I'd love to see the A's sweep the Mariners a tad bit more. Worst case scenario is watching Ichiro go 0 for 8, while seeing the A's start the 2019 season 0-2. If that happens, I'll definitely be shaking my head. What are some things about the 2019 MLB season or the hobby that currently have you shaking your head? We are going to Seattle next Monday to see them play against the Padres on Monday and Tuesday. Great grab on that Ichiro! Mine is probably doing away with Bunt for Big League. I know I’m in the minority but I liked Bunt a lot more. I also don’t like this year’s Big League design. I'm at an age where I shake my head over something every day, so "too many to mention" for both baseball and the hobby. Also, that thing where people refuse to use their turn signals: STOP DOING THAT. Some of the rule changes are surprising, like the drop in the number of players on the roster in September. You would figure that more roster spots means more money for the players so the Players Union would want the 40 man roster in September to stay instead of losing 14 or so spots per team. For the hobby, the 150th Anniversary online set is kind of surprising. You figure with the Topps Now and the Throwback online sets that the 150th Anniversary set wouldn’t have too much appeal except for player collectors. I am also kind of surprised that Beltre, Mauer, Wright, and Victor Martinez didn’t get a sunset card in Series 1. They don’t do that many true sunset cards anymore, but some star players like Jeter, Rivera, Konerko, etc got one, so you would figure Mauer, Beltre, and Wright could’ve got one. Maybe in Series 2. The whole state of the hobby has me shaking my head, but that's not new. I could go on for quite a while on 'super short prints', exclusive licensees, expensive packs and why a set like Opening Day even exists. But rather than whine I just happily ignore it all and stay busy with what I like. That's what makes the hobby fun...there is something for everyone. On that Ichiro...there was a thread on Net54 not long ago about graded cards worth less than the cost of submitting them. I recently bought a pair of NY Rangers vintage cards in PSA holders for a couple of bucks total. Baffled me as well. I hate when regular season MLB games are played anywhere else but In the U.S.Exhibitions I'm fine with.I feel that's precisely what threw the Mets off their season in 2010 when they went to P.R. to play the Marlins. Great snag for that price. I agree with Commishbob in that there's a lot going on. Exclusives, Archives + Heritage + flagship insert reprint redundancy, insert bloat and now scarcity in packs, parallel inserts, and on and on. I feel a disconnect from the real-life game too. Mostly since last year my teams tanked badly. It seems that the hype machine (both cardboard and media) is running in the red part of the meter all the time over any little event. Or maybe it's just normal coverage, but I don't care nearly as much. I can really see myself quitting current product except for the occasional A&G or GQ set that I like in the next year or two. Filling in vintage, and up to the 2000s, plus my player and other misc collections leave plenty to strive for. Awesome card for the price paid. I am shaking my head that Trout, Arenado, Machado, and Harper contracts signed this year are more than the Rays payroll has been in 21 years of exisistance. That is mind boggling that these 4 superstars got paid more than an entire teams payroll history. Issuing an intentional walk without throwing four pitches makes me shake my head, for sure. 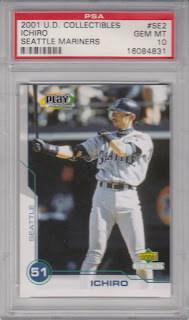 As for the Ichiro card, great pickup at a great price! rod (padrographs) - hope you're able to add a few signatures to your frankenset. commishbob - the whole thing about graded cards being sold for less than the submitting fees is definitely one of sports card's conundrums. collecting cutch - wow. that's an awesome piece of trivia. gregory - yeah. i agree the pitcher should have to throw. it's part of the game. i've seen batters crank some of those intentional walk pitches before. Awesome! Just in time as I heard he retired today!